Megalencephaly, polymicrogyria, polydactyly, and hydrocephalus (MPPH) syndrome was first described in 2004. All cases reported up to date have demonstrated four classical features including megalencephaly (MEG), perisylvian polymicrogyria (PMG), postaxial polydactyly (POLY), and hydrocephalus (HYD). Neurologic problems associated with BPP include oromotor dysfunction, epilepsy, and mild-to-severe intellectual disability. MEG is a growth development disorder in which the brain is abnormally large and can be classified into anatomic and metabolic types; anatomic MEG is characterized by brain enlargement due to increased number or size of cells bout with no known metabolic abnormality, but metabolic MEG is a condition in which cerebral enlargement is due to edema or an accumulation of metabolic products, without an increase in the number of cells. The clinical picture of the syndrome has different variations; however, the anatomic MEG has been described in a broad range of situations, some of which are overgrowth syndromes, such as Sotos  and Weaver–Smith syndrome, and overgrowth syndromes with vascular anomalies such as macrocephaly–cutis marmorata telangiectasia congenital syndrome.,, Here, we present the case of a patient with this condition. A 5-year-old girl was born to healthy nonconsanguineous parents at 37 weeks of gestation by cesarian section after three consecutive abortions. She underwent surgical repair of her large thoracolumbar myelomeningocele few days after birth. She was referred to our neurological surgery clinic with HYD. On physical examination, the patient was wheelchair bound, with long midline scar from thoracolumbar myelomeningocele repair. Head circumference was 54 cm (>97th centile) with no obvious facial dysmorphisms. She had good vocalization and was able to communicate with her parents and obey commands normally, along with great social reaction and higher mental function. Bilateral polydactyly along the middle digits of the hands and syndactyly of both feet was observed [Figure 1] and [Figure 2]. A computerized tomography scan and magnetic resonance imaging of the brain was obtained postshunt insertion which revealed MEG, bilateral thickened poorly formed gyri, dysgenesis of corpus callosum, and adequately treated HYD [Figure 3]a,[Figure 3]b,[Figure 3]c,[Figure 3]d. Commercial Karyotype Genetic analysis was normal for the patient and her parents [Figure 4]. In 2004, Mirzaa et al. described five cases of multiple congenital anomalies and mental retardation (MR) with features of severe congenital MEG, PMG, POLY, and HYD. The authors reported that these clinical findings represent a new and distinct malformation, which they named MPPH. The condition that must be considered in the differential diagnosis is the macrocephaly–cutis marmorata telangiectatica congenita syndrome; some patients with this condition have had MEG, PMG, and HYD, but in our report, the absence of cutaneous hemangiomata and the presence of PMG excluded this syndrome. MEG associated with other abnormalities has been described in several other congenital syndromes including disorder with mega-corpus callosum which was absent in our report., Facial dysmorphism has been described in other reports, which represents phenotypic variation that included variable degree of prominent forehead, hypertelorism, telecanthus, a depressed nasal bridge with increased inner canthal distance, a bulbous nose, and large jaws with a small mouth, which was also absent in our report. MR was reported in previous case reports. In contrast, our patient had good vocalization and was able to communicate with her parents and obey commands normally, along with great social reaction and higher mental function; therefore, our report has unique findings which make an additional feature of this syndrome. MPPH syndrome was first described in 2004. Each case reported so far has demonstrated four classical features as MEG, PMG, POLY, and HYD. 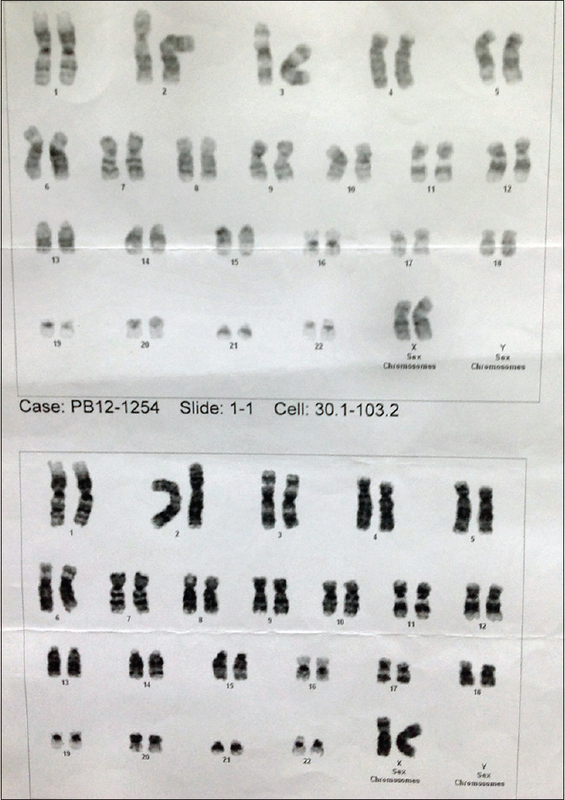 Since MPPH syndrome lacks consistent somatic features other than postaxial polydactyly; our case presented with central polydactyly, myelomeningocele and syndactyly of both feet instead of postaxial polydactyly. This observation therefore expands the spectrum of phenotypes featured in this rare condition. The authors wish to thank the cooperating family members for the necessary medical data and photographs for publication. Mirzaa G, Dodge NN, Glass I, Day C, Gripp K, Nicholson L, et al. Megalencephaly and perisylvian polymicrogyria with postaxial polydactyly and hydrocephalus: A rare brain malformation syndrome associated with mental retardation and seizures. Neuropediatrics 2004;35:353-9. DeMeyer W. Megalencephaly in children. Clinical syndromes, genetic patterns, and differential diagnosis from other causes of megalocephaly. Neurology 1972;22:634-43. Schaefer GB, Bodensteiner JB, Buehler BA, Lin A, Cole TR. The neuroimaging findings in Sotos syndrome. Am J Med Genet 1997;68:462-5. Amir N, Gross-Kieselstein E, Hirsch HJ, Lax E, Silverberg-Shalev R. Weaver-smith syndrome. A case study with long-term follow-up. Am J Dis Child 1984;138:1113-7. Clayton-Smith J, Kerr B, Brunner H, Tranebjaerg L, Magee A, Hennekam RC, et al. Macrocephaly with cutis marmorata, haemangioma and syndactyly – A distinctive overgrowth syndrome. Clin Dysmorphol 1997;6:291-302. Garavelli L, Leask K, Zanacca C, Pedori S, Albertini G, Della Giustina E, et al. 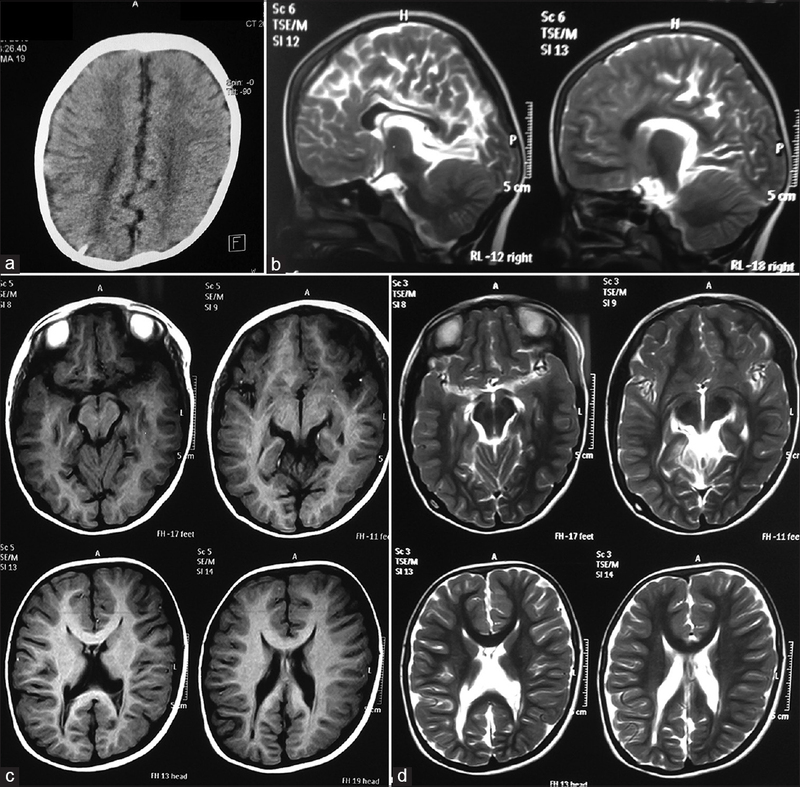 MRI and neurological findings in macrocephaly-cutis marmorata telangiectatica congenita syndrome: Report of ten cases and review of the literature. Genet Couns 2005;16:117-28. Moore CA, Toriello HV, Abuelo DN, Bull MJ, Curry CJ, Hall BD, et al. Macrocephaly-cutis marmorata telangiectatica congenita: A distinct disorder with developmental delay and connective tissue abnormalities. Am J Med Genet 1997;70:67-73. Barkovich AJ, Kuzniecky RI, Jackson GD, Guerrini R, Dobyns WB. A developmental and genetic classification for malformations of cortical development. Neurology 2005;65:1873-87. Göhlich-Ratmann G, Baethmann M, Lorenz P, Gärtner J, Goebel HH, Engelbrecht V, et al. Megalencephaly, mega corpus callosum, and complete lack of motor development: A previously undescribed syndrome. Am J Med Genet 1998;79:161-7. Pisano T, Meloni M, Cianchetti C, Falchi M, Nucaro A, Pruna D, et al. Megalencephaly, polymicrogyria, and hydrocephalus (MPPH) syndrome: A new case with syndactyly. J Child Neurol 2008;23:916-8.